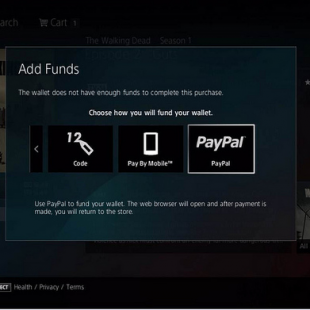 Shopping on your PS3 just became a bit easier thanks to new PayPal options for the PlayStation Store. About a month ago I lost my debit card on the bus. On the whole it was a hassle, but the whole ordeal was pretty much over after a quick trip to the bank. At least, I thought it was. The dark specter of mild inconvenience reared its ugly head a few weeks later when I logged onto the PlayStation Store to take advantage of a sale. I went to pay and was swiftly met with an error message reminding me that my card on file, the old one, had been cancelled and I would have to enter a new one to add funds. Not wanting to leave my couch groove to trudge upstairs and grab my wallet, I abandoned the sale. Luckily for gamers everywhere, my fate no longer needs to be a shared one. This is because Sony has announced that the PS3's PlayStation Store will now support PayPal as a valid payment option, removing the necessity of a credit/gift card. The new PayPal funding options will allow gamers to add as much as a $150 to their PS Store wallets with their PayPal accounts and can be used to "purchase games, add-ons, movies, TV episodes and more." The new PayPal funding options come only a short while after the addition of mobile billing that allowed gamers to add funds to their wallet using a mobile phone connected to their account. Likewise, players could previously use PayPal to add funds to their wallet over the internet. The new PS3 options basically just streamline the process so you can do it all without the aid of any other devices. Even so, I consider it a win for lazy gamers everywhere.